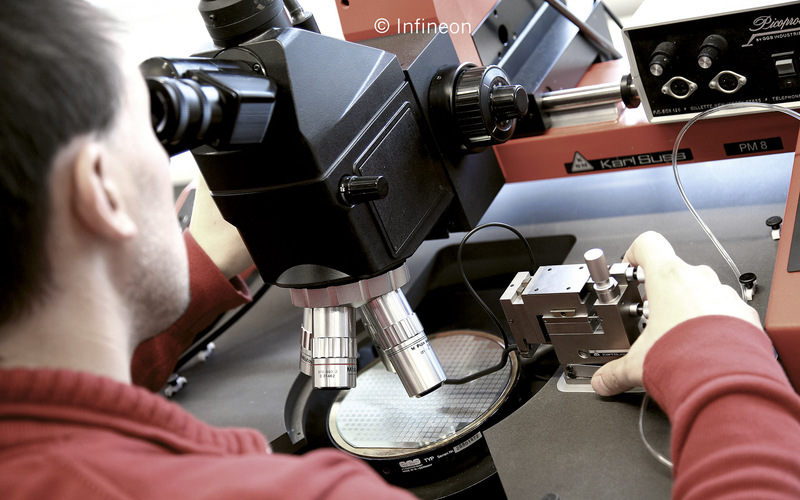 The internationally active semiconductor company Infineon is based in Neu­biberg, near Munich, Germany, but its Austrian headquarters is located in the most southerly state in Austria, in the town of Villach. The company, once the compo­­nents arm of Siemens, has been an impor­­tant part of the town of Villach for forty years and is the largest private employer in the state of Carinthia. More tradition than innovation? No way! Infineon’s semiconductor products and system solutions are making a significant contribution to three of the key social issues moving into the future: energy efficiency, mobility and security. As a leading competence unit (LCU), that is the decision-making and expertise centre of a global player, the Austrian branch is an important pillar of the economy and of great significance in the region. 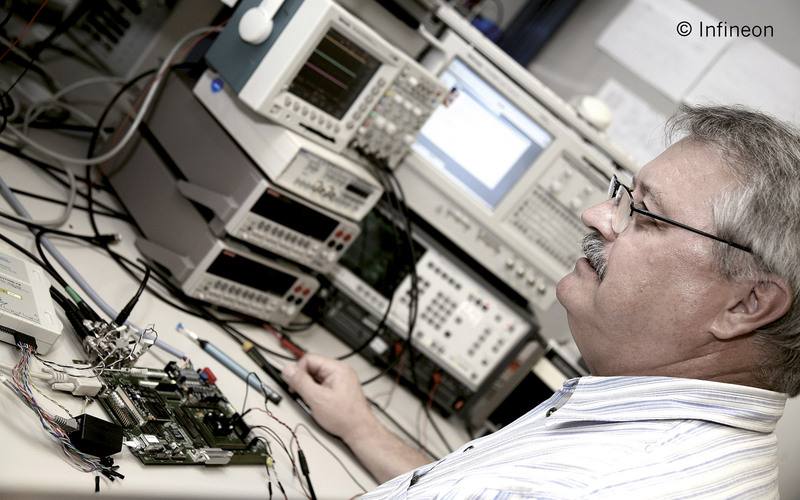 Electronic components for a range of tech­­­nologies and levels of complexity are produced in up to 400 production steps in the Villach factory. One of the greatest challenges in the power semiconductor sector is producing chips on thin wafers. Wafers are slices of silicon, which are used as a substrate in the production of micro­­chips. 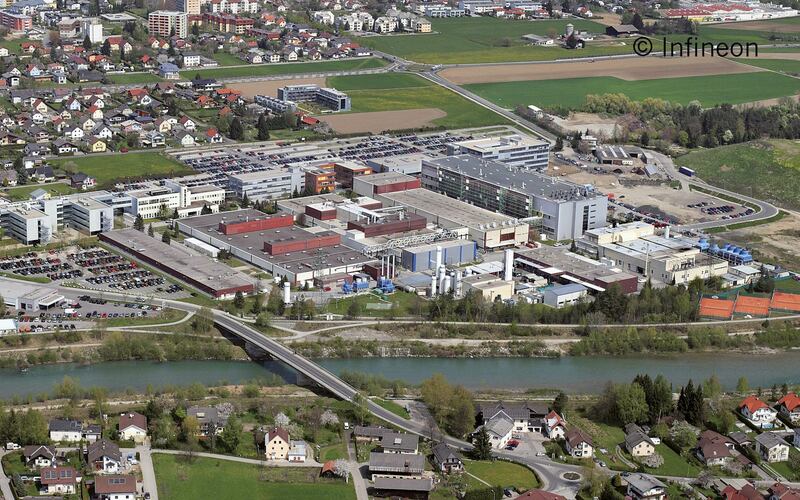 Villach is unique in the world in pos­­sessing expertise in production on silicon slices just 40 micrometres thick. For comparison, a sheet of paper is around 100 micrometres thick. The use of thin wafer technology allows greater electrical power in products for cars and industrial applications, resulting in lower trans­­mission losses without higher switching losses. This means that thin wafer tech­­nology contributes signi­­ficantly to the energy efficiency of ter­­minal equipment. This expertise was awarded the state of Carinthia’s Inno­­vation and Research Prize in 2009. Internationally recognised expertise in both automobile electronics and especially in energy saving chips has been established and consistently developed in Villach. For over three years now, we have been committed to an innovation initiative which intensifies cooperation between research, development and pro­­­­duction in a targeted way. The foundation for this is a corporate culture sup­­ported by a range of activities which cultivate the po­­ten­­tial of staff and create space for new ideas. “Innovation Days” provide a plat­­­­form for exchanging experiences and ideas, push­­ing forward issues which will be cru­­cial for market success in the future. For example, innovation projects from 2008 are already contributing to a substantial in­­crease in the efficiency of solar equipment. Also of note is an automation initiative in production, in which cooperation bet­ween people and machines is being optimised through the use of new robot systems, allowing clear improvements in quality in the production of complex wafers. 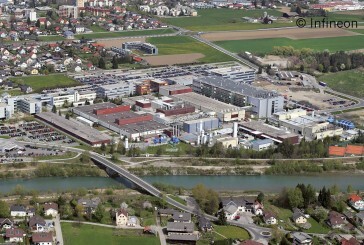 Fol­­low­­ing a subsequent feasibility study on the production of 300 millimetres thin wafers for power semiconductors, the Group decided to start pilot production of them in Villach. Semiconductors are indispensable for electric vehicles. Semiconductor solutions can help to accelerate technological break­­­­throughs in all areas – costs, battery range, charging infrastructure and smart grid. Electrical mobility therefore plays a sig­­­­ni­­ficant role in many respects. Together with top companies from industry, re­­search and the energy sector, Infineon Austria is parti­­cipating in the nationwide “Austrian Mobile Power” platform, which aims to drive con­­cepts for electrical mobility forwards. Innovation is an important basis, both for us and for Austria as a country of business and technology. To ensure that we continue to be seen as an important high-tech location within Europe in the future, we in Villach are focusing on a consistent strategy based on research, science, edu­­cation and innovation. That is why we invest so intensively in re­­search and development projects. 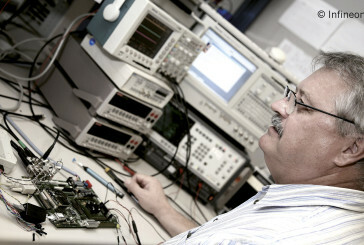 In the 2010 fiscal year, around 15 per cent of total turn­­over went into research and development. Microchip production in Villach is driving forward a structural change which will result in an “innovation factory”. This means that staff will engage intensively with optimisation issues in production as well as along the entire value chain, from the idea to the processes and all the way to the customer, thereby contributing significantly to the compe­­titiveness of the production location and assuring its position for the future. The use of new base materials such as silicon carbide in semiconductors allows the realisation of especially compact and fast switching power supply units with high reliability and low electricity consumption – a broad field for research and development. The plant in Villach was the first produc­­­­tion facility in the world to control pro­­duc­­tion units using a range of wireless tech­­nologies. 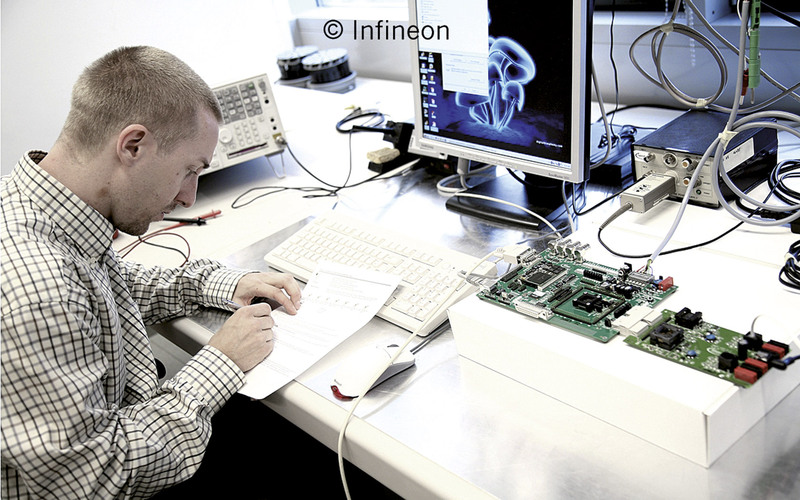 The software for this project, known as “iFab”, came from the Infineon subsi­­diary in Klagenfurt, and the complex chip technology from the Development Center Graz. This earned Infineon Austria the state of Carinthia’s Research and Inno­­­vation Prize in 2004. Today, this logistics system is already being implemented suc­­­­cessfully in the company’s other factories. The synergy between research and develop­­­­ment, production and business respon­­si­­bility for defined business fields provides overarching knowledge at the Villach site, while this cooperation benefits from proxi­­mity. Making even more effective use of this advantage for the company means going down unusual routes. As part of an expert development programme, staff switch to a different job within the company for a defined period, for ex­­ample from production to marketing. This expan­­sion of the staff’s expertise and the better understanding of the processes in the value chain it brings allow optimum cus­­tomer solutions to be found more quickly. With their motivation, flexibility and ex­­per­­tise, the staff make a fundamental contri­­bution to the success of the company. 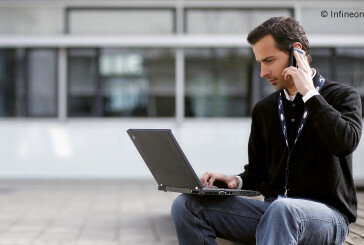 Their potential for innovation and ideas are a valuable asset to the company. Training and continuing education is very important – for competitiveness too. Many years of specialist expertise in defined research fields and production techno­­logies, together with an active enthusiasm for new ways of thinking, combine tradi­­tion with innovation in a productive way. We make every effort to secure the world’s best people for our company and to gain their loyalty along with their enthusiasm and knowledge. We employ people from 40 nations, and this international atmo­­sphere makes a significant contribution to the innovative power of the company. An integrative environment is essential for both the staff and their families, so that the full potential of staff who come from countries with different cultures, laws and social structures can be devel­­oped. This requires an appropriate infra­­struc­­ture, such as international schools, con­­sul­­tancy and the exchange of informa­­tion. One networking platform is offered by the Carinthian International Club (CIC), founded by the industry and science ins­­­­titutions of Carinthia, where the opportu­­nities and challenges of the modern work­­ing world can be discussed and positive ideas for everyday life exchanged. Ingrid Lawicka has been active in various marketing and communications roles in the Austrian technology sector since the mid 1980s, including at Apple Computer and Siemens Nixdorf. As a member of the ex­­tended management team, she headed the marketing and communications depart­­ment at Fujitsu Siemens Computers. She has been the head of corporate communica­­tions for Infineon Technologies Austria since 2004. Monika Kircher-Kohl began her career heading the regional office of the Austrian Information Service for Development Policy (ÖIE). She worked as a freelance consultant and lec­­turer at the University of Klagenfurt, before spending ten years as the deputy mayor of the town of Villach from 1991. In 2001, she was appointed to the executive board of Infineon Technologies Austria and has been chair of the executive board since 2007.